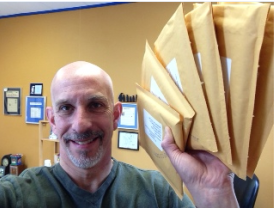 … sent a book to each of the people who’ve signed up for my One Year Marketing class. They’ll each get five more during the course of the year, sent directly from Amazon. But I like to send this first one myself, so that I can include a handwritten note. It’s a little bit nicer that way, don’t you think? Yes, a handwritten note is always nice to receive. I agree. Hard to sit down and send but it always hits the spot on the receiving end! As a very satisfied participant in your One Year Marketing class, let me thank you for the books (can I also thank you for a thank you note?). Great class — learning a ton, and finding it all so helpful. Thank you Steve (check is in the mail)!